At this year’s Peace and Freedom Party convention, held Aug. 12-14 in Sacramento, Calif., delegates were reminded of their party’s early and rich anti-racist history and were urged to show solidarity with the struggles of Black and Brown people against police murders by nominating Monica Moorehead and Lamont Lilly, Workers World Party’s presidential candidates, to head their ticket. While Moorehead and Lilly did not win the nomination, the PFP was moved to a greater understanding of the need to build solidarity with the Black Lives Matter uprising. The PFP has ballot status in California and has usually endorsed candidates of national parties in the presidential elections. Dave Welsh, a retired postal worker and member of PFP since 1967, motivated the discussion that continued throughout the weekend. “In the early days of the Peace and Freedom Party, the movements against the Vietnam War and the Black Liberation movement were the focus for our presidential campaign. We formed an alliance with the Black Panther Party. The comparable issue here today is support for the Black Lives Matter movement, and Monica and Lamont have done a tremendous job of supporting that movement,” Welsh concluded. The convention began Friday night with speeches from the four presidential candidates: Moorehead and Lilly for WWP; Gloria La Riva for the Party for Socialism and Liberation; Lynn Kahn, an independent; and Laura Wells representing the Green Party candidate, Jill Stein. The unspoken question of the night was: Which way forward for the PFP and for the movement of activists, who need to be convinced to support socialist candidates in the upcoming elections? Both WWP candidates in their opening remarks to the convention urged the PFP to show their solidarity with the Black and Brown youth who were fighting in the streets against police killings and terror. They called for unity among left parties to support the most oppressed. “Those were the youth and working poor we saw in Ferguson and Baltimore fighting back against tanks and teargas with their bodies, laying it … all on the line, connecting their local struggles to Palestine and Libya … building on the revolutionary spirit of Cuba, Puerto Rico and Venezuela,” added Lilly. Both Lilly and Moorehead traveled to Ferguson to show their solidarity after the police assassination of Michael Brown. The other presidential candidates found themselves pressed to express their support for the Black Lives Matter uprising in their talks. Saturday was the day for nominations from the floor for the various candidates and the final tally of delegate votes choosing the 2016 PFP presidential candidate. Jefferson de Azevedo, a member of the Los Angeles branch of WWP, stressed the need for all the groups seeking the PFP nomination to work together in unity. “We’ve got to stop being so individualist, and be socialists. We must work with each other and help each other or we will never win. My enemy is capitalism,” Jefferson said. At the same time that Parker and other delegates were speaking, a Black man was being shot and killed by the police in Milwaukee, and the Black community was rebelling against this latest police murder. The WWP candidates lost the political battle to be on the PFP ticket; the delegates chose Gloria La Riva of PSL. Despite this, Moorehead and Lilly made a strong impression on the other candidates and on the PFP delegates. The discussion of the weekend was framed by the overwhelming need to build solidarity with the oppressed communities, particularly with the struggles of Black and Brown people against police terror and murder. 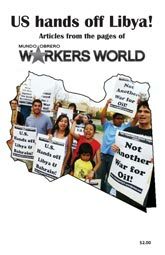 The Moorehead/Lilly campaign will run a write-in campaign in California (and many other states) and continue to politically organize to demand “Black Lives Matter, stop ICE [Immigration and Customs Enforcement] and all deportations, and abolish capitalism.” The WWP candidates will be on the ballot in other states, including New Jersey, Utah, Maryland and Wisconsin.